NEW HAVEN, CT- On the second day of the Yale Invitational, Ryan Baker’s Colgate Raiders clashed with Coach Chris Campbell’s Boston College Eagles. It would end up being a sweep for ‘gate 3-0 to take the match. Set 1 opened with Colgate building a quick lead, Caitlin Cremin’s service ace opened the match, Lindsay Young tipped the ball over the net, later Kayle Dougherty picked up a kill, and following a good defensive save by Diane Seely, the Raiders were up to a 7-3 advantage. BC’s Tsvetelina Dureva scored a kill with her smash during this time though some Raider miscues let the Eagles back in and the score was soon 7-6. The teams traded some points and Colgate’s Kenzie Hume’s cross court slam put the lead at 3, BC’s Alex Fitzmorris returned fire, but Colgate’s Dougherty and Kaylee Fifer each had spikes to put the set at 13-8. The lead grew to 19-9 and Boston College called time. When play resumed Dureva picked up a cross court kill, though Dougherty responded with a tap in, and a shared block with Seely . BC kept coming though and among other things a Melissa McTighe smash and a block shared with Fitzmorris cut the lead to 21-14. Fitzmorris would pick up another kill and Val Mattaliano and McTighe shared a block for a 22-17 score. Colgate pulled within set point with two more points though BC held it off thanks to another Fitzmorris/McTighe block and Brennan Clark had an ace. The score was 24-19 when Colgate ended it with a kill 25-15. On to set 2, Colgate pulled out to a 8-2 lead including Young’s kill to start things off, a kill off the D and out of play by Dougherty and some BC miscues. Krystle Higgins of BC stopped the run with a kill of her own, though Colgate added two more points including Hume and Fifer’s block. Dureva struck again with a huge smash, though Fifer ended a long back and forth to keep the lead at 11-4. The lead would grow to 15-7, though Mattaliano hit a jumping kill to set off a run of point trading including another kill from her and kills from Blaire Safir, Seely, and Hume of ‘gate. BC mounted another comeback consisting of Higgins with a put down at the net, another kill from McTighe, a spike off the d out of play by Dureva, among other things, though the score was still 22-15. A time out stopped the BC run as Dougherty emerged from it with a kill, followed soon after by Young and a crushed attack from Seely ended the set 25-17. Set 3 began with another Colgate lead as Dougherty, Young, Dougherty again, and Young again contributed to the offense. On one play both Fifer and Lexi Finger had some excellent defensive plays to keep the ball alive. It was soon 7-3 despite a kill from Fitzmorris and Higgins for BC. The Eagles however turned the tide with a blast from Mattaliano, followed by Higgins putting the ball down at the net, and Alexandra Trobbe serving an ace up. Soon it was 7-7. A block by Higgins and Cagla Sen brought the Eagles a lead, and a point later Colgate was calling a time out, but BC kept rolling with a jumping kill by Higgins, the dangerous Dureva striking again, and Trobbe setting the ball to the back gap. The score was soon 8-14. Fifer responded with a misdirected fake set for a point, but Sen’s kill kept the advantage. Colgate tried to build their way back though BC kept up. The score was 13-18 thanks to a Higgins big spike, though Seely responded typhooning an attack over and in. BC picked up three straight points, on a miscue, and Dureva’s kill and block. Hume picked up a running and jumping kill for the Raiders. Dureva then shot a ball off the blockers and out of play, and McTighe had a kill of her own the score was now 15-23. 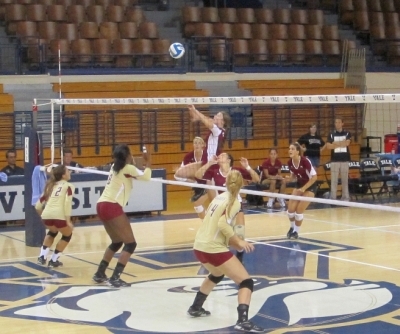 BC needed two points to win the set, but they would not score again. Finger served up an ace, a BC attack error followed, then Fifer sent the ball into a corner, and teamed up with Hume on a block. A BC attack error had narrowed the score to 21-23 and a time out didn’t help as Hume smashed the ball across the net. She and Fifer teamed up on a block and Young’s smash put Colgate ahead 24-23. On the next back and forth Hume and Fifer shared the block that would win the set and the match 25-23. It’s rare to see an unanswered run of that kind in volleyball, but Colgate did it and took the sweep. Editor’s Note: This is based on notes taken at the match, normally verified against the official play by play if possible. Reports focus on offense since it is easier to track but note defensive play whenever possible. Also, a lot happens in a volleyball game, far more than can fit into a report, so this just notes some of it.